Sibling Relationships: Are They Still Crucial in Adulthood? I was in a bookstore the other day and told my kids that they could each purchase a small book. My eight year-old son came back with a book containing a 1000-question quiz about J.R.R. Tolkien. My five year-old daughter came back with a book about sea creatures. “It’s a non-fiction book, Mama,” she said proudly, “non-fiction” being a term recently incorporated into her vernacular. “Great! Why did you choose it?” I asked. Her comment went through me like a knife. It was one more sign – like her cross-dressing – of just how much she idolizes her big brother. Whereas he could quite happily live without her. My husband and I keep hoping that this will change as they grow older. We often tell our son how we both fought a lot with our siblings when we were young, but are now good friends with them. But inside I’m not so certain. Much of the literature on sibling relationships seems to focus on childhood. Things like birth order get championed as crucial determinants of personality type, and there are loads of books and advice out there for managing sibling rivalry. But what about sibling relationships in adulthood? Do those matter, too? The evidence would suggest that they do. A recent study of Harvard grads found that being close to one’s siblings at college age was a crucial determinant of emotional well-being at 65. Which isn’t surprising, of course. For many people, sibling relationships are the longest ones they’ll have over the course of a lifetime. And in America, at least, 96% of all people have at least one sibling. Anecdotally, we all also know that sibling relationships continue to matter in adulthood. I was quite taken with this article by Emmet Rosenfeld in the Washington Post last month. It tells the story of twin brothers, one of whom (the author) is struggling to make ends meet as an educator (married to an educator) living outside Washington DC, while his brother (a lawyer married to a psychiatrist) lives a rather high-pressured, high-priced lifestyle in New York City. It’s a very frank account of how the brothers – who grew up in the same family and had very similar undergraduate educations – diverged so markedly once they hit adulthood. And in it, you feel all that familiar mix of jealousy, competition, regret and admiration that so often characterizes adult sibling relationships. (Truth in advertising: I know the brothers in question, though only in passing). Twins, of course, present a very special case of everything. I’ll never forget one twin friend – a successful businessman, whose brother was a doorman. When asked whether they ever competed as children he answered, “Of course.” Then he paused and added: “And I won.” Ouch. But if these sentiments sound harsh, it’s because they’re also very real. And so when I look at my daughter painstakingly copying down the names of all the sea creatures in her little book so that she can one day recite them from memory – as her brother now does with the characters who populate the Lord of the Rings trilogy – I do feel a pang. And I wonder if she, too, will one day feel the need to write a personal essay dissecting the early competitive/imitative dynamic with her brother and how it’s shaped her as a grown-up. Undoubtedly, she will. I can only hope that they’ll be best friends by then. If you’re interested in the whole head scarf/women’s rights debate in France, have a look at my piece in PoliticsDaily today. 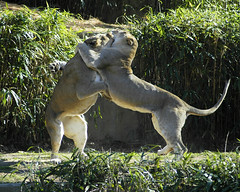 Image: Sibling Rivalry by Ucumari via Flickr under a Creative Commons License. I really believe these statistics on happiness. I am the oldest of four children. We fought like crazy when we were little. But as we grew up we did become the best of friends. Which is true to this day. I have seen it with my own children too. That is not to say that siblings who are estranged in adulthood have to be unhappy. The woman whose story I tell is quite happy with her life, mainly because she has surrounded herself with people who love her, and does what she loves for a living. That gives her strength when she gets sad over how toxic things got with her brother. Sometimes, things just don’t work out, and you have to be happy with the things that do. Thanks for sharing this. It’s a moving – and not unfamiliar – tale. I don’t think everyone ends up close with their sibs and I also think some sibs never get over the younger one being born. A lot of it probably comes down to how the parents handle it, which is why I’ve read Siblings Without Rivalry like 4 times (though still fail to internalize all of its messages!) The mother in your story seems like she was totally oblivious to the effect of her newborn on her son (I’ve also witnessed friends of my son’s who come over and terrorize my daughter…although they are usually youngest children who can’t deal with having someone younger than them…). So this story really resonated for me on multiple levels. On a completely different note, what wordpress theme do you use? I love the look of your blog and will be making a change soon…thx! Being aware of such things, as a parent, may make all the difference. At the end of the day, of course, there’s only so much you can do, but at least trying is important. I get the feeling that, in the case of little Chad and his mom, she is so overwhelmed by outside problems she doesn’t want to deal with it. And yes, she is aware he is a bully; she said something to that effect to my friend. But she doesn’t seem to make the connection that Chad is bullying smaller kids because he can’t get at his sister. My friend plans to ban Chad from the house if anything else happens, and is really happy Sam and Chad are attending a different kindergarten this year. Good to read about the sibling relationship which gets so little play relative to the romantic one. Very important in both childhood and adulthood. Jennifer / I have three sisters and one brhoter. Even though most of us are a distance from each other, we keep in contact regularly and, when we need each other a phone call is all it takes to bring us to each other’s doorsteps! We enjoy getting together for holidays, and then those special just because times! So GREAT to have a GREAT family! And, of course, it’s the same way in the family of God you have great friends to fellowship, pray with, laugh with, cry with, etc. You can be a blessing to them, and they can be a blessing to you!